MuPDF, a lightweight PDF, XPS, and E-book viewer, reached 1.12.0 release recently. Here’s how to install it in Ubuntu 16.04, Ubuntu 17.04, Ubuntu 17.10, and their derivatives. LCMS2 library for color management. CMYK rendering with overprint simulation. New semantic XHTML output format. New layout preserving HTML output format. Improved non-AA rendering with new scan converter. Add PCLm, and PSD output. New “mutool sign” tool (work in progress). And lots of bug fixes, See NEWS for details. Besides building the tool from source, there’s an unofficial PPA with the packages for Ubuntu 16.04, Ubuntu 17.04, Ubuntu 17.10, and their derivatives. Type in password (no visual feedback due to security reason) when it asks and hit Enter. If you have a previous release installed, simply launch Software Updater to upgrade the tool after checking for updates. 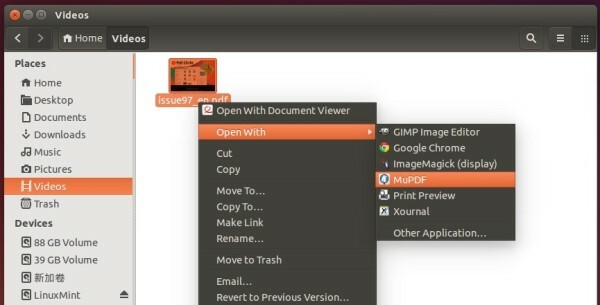 To use the PDF/XPS viewer, right-click on your file and select open with MuPDF. You can also set MuPDF as default in the Properties window.